The harsh chemicals I was subjected to pushed me into a state of mentally scattered bleakness. At some points (even though I generally feel detoxified from chemo by this time) this is still the case... Anyway, between the pain and the poison, I took the skills I had recently picked up in a community college drawing class and began to seriously practice rendering a face. I managed to turn my habit of lurking at friends' selfies into something actually productive. I fell in love with it, and during both high and low trials of life, I've devoted the past 8 years honing and developing the calling. Let me delve into my experiences in healing the body, mind, and soul.. may it inspire you. When my knee started hurting in the spring of 2010, I was so sure it was only a sprain- maybe a broken ACL- and I was just looking forward to partying all summer before I went in for the inevitable x-ray. I got a prescription of narcotics (you know, to take the edge off but keep my head straight… or so I thought), and partied on. And the pain, it kept getting worse. I went to a Fort Bragg coast house with my friends, tried like hell to keep smiling, and didn’t even make it through the whole weekend before I left for the hospital basically in tears. That was summer’s end. I got a call from my doctor the next day: she was all soft-spoken, “It looks like a tumor. We’re going to do a biopsy to see if it’s malignant or benign. You might have to do a little bit of chemo.” A ‘little bit? !’ There is no such thing. I did the biopsy- and received a pretty great dose of Versed. My best friend still makes me talk about that drug, because it makes me smile to remember how it made me feel. I'm fairly certain I lost some brain cells with that. Let me say- I do not recommend this; just reminiscing. Anyway, the biopsy hurt like hell, but I discovered there was, in fact, a malignant bone tumor taking over my knee. I did not know what to do; just that I wanted to find an "organic" way to deal with this. My dad learned about Rick Simpson’s cancer cure of cannabis oil, and hooked me up with some of that. At the time, he was also spending time with some amazing people who were into natural remedies such as wheatgrass. This opened the doors to natural healing for me. I spent the next two months perpetually in a sleepy stoned state of nearly comatose giddiness. 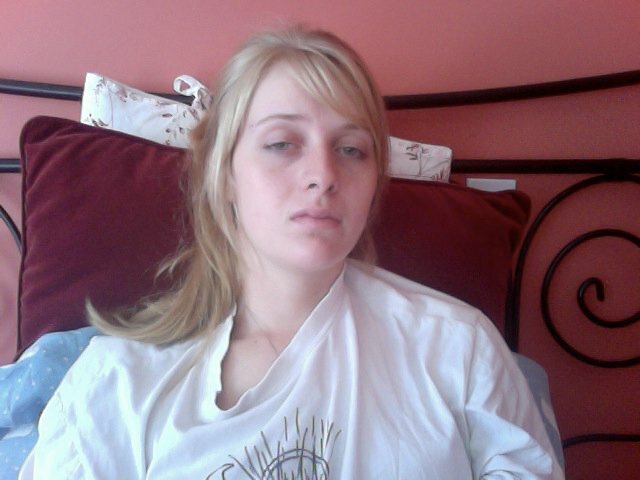 But the pain persisted, worsened… This picture of me is from that moment in time, wearing my Daniel Johnston t-shirt like some sort of lifeline. Might I mention that my love of music- as much then as now- played a key role in helping me cope. No matter what plagues you, mentally or physically, find a sound that harmonizes your soul, and let the pain melt away... In my case, the sickness led me to discover my purpose and mission; and I found a complementary balance of music, weed, and healing food to help me along. At the end of September 2010 came the point where I decided to bite the bullet and go for the chemotherapy. That brought a whole new meaning to the word ‘pain.’ It felt like acid running through my veins; eating me from the inside. So much vomit it hurt to even breathe. That was my first three days of chemotherapy- you can only imagine what it did to my already compromised heart and energy levels. My hair started falling out (luckily I cut it short in the Amelie fashion). It was a nightmare. Without the oil and the wheatgrass to replenish my heart, it would have killed me. If you’re doing chemotherapy or battling cancer without, weed is your friend. Lots of it. In my humble opinion and as an artist, weed is your friend even if you’re not immediately dying. It will put your body into a relaxed state where you’re most receptive to healing, and also open to creative flow. To further push the door open to healing, my dear friend visited me with recipes and teas to warm my soul & body. I learned about the benefiting qualities of red foods (cranberry, beet, pomegranate, etc.) in strengthening the immune system against cancer, as well as herbs and supplements to not only promote circulation but also those for healthy bone growth. All my life, I had found comfort, solace, and escape in books. My favorite genres? I was always drawn to Agatha Christie murder mysteries, but I’d say I had equal love for fantasy and historical drama. This is still the case. The books that help me through need their own separate blog; my point is... love of literature sounds perfect for hours of hospital/chemo, right? Not so. I found myself to be completely unable to concentrate on reading even a paragraph. My life became a series of shows and pictures; the pivotal point where I discovered my passion. I want to encourage you- no matter who you are or what plages you- to find your escape. Find whatever it is that pulls you out of the treacherous abyss and into a world of healing. I learned of many valuable nutrition tips during my cancer struggle, I've picked u- so many more in the years since. It's hard to cover them all in just one post- but let me describe a few that would have been amazing to know about sooner. Believe it or not, I had absolutely no clue what kombucha even was until the summer after I was in the hospital. This is surprising for someone in their twenties, and especially in my case, being that I am completely obsessed with the brew. A powerful health tonic, kombucha is a "secondary culture of bacteria & yeast" (SCOBY) that some brew themselves; and some opt to buy in grocery stores- saving the increasingly valuable commodity of time. I had a culture going for awhile; and while I don't want to go into details of chemistry here and now, as a brief description: kombucha is fed by black tea and sugar. When you drink the fermented tea, it works to alkalize the blood by eating excess sugar in the body. Needless to say, that makes it the perfect weight-loss drink as well as a great anti-cancer tonic (seeing that cancer thrives on sugar). With these properties, a delectable fizziness, and the digestive health kombucha offers, I cannot recommend it enough. I've gone into detail on a few helpful reminders, but I must stress the importance of blood detoxifying. First on this topic, I recommend getting ahold of a copper drinking vessel. Do you recall how many water pipes are lined in copper? It has the best anti-rusting qualities; ideal for hydrating your system. Also, let me address the pivotal fact that I received a couple transfusion of healthy blood; the ultimate life-giving source. I am quite certain that without this and everything else I discovered, I would not be here right now to share it. I shall leave with a sickness survival list, and my blessings to your good health! -(naturally) red foods- i.e. cranberries, goji berries, pomegranates, beets, cabbage, etc.